Below is the list of all of Mad Science of St. Louis's exciting hands-on workshops. Charge up on static electricity! Make indoor lightning and conduct hair-raising experiments with our electro-static generator. Use your Static Stick to test the movement of electrons in your home! Explore the power of magnets! Control a compass needle. See a magnetic accelerator in action. Take home your very own Magnet Lab to continue your research! Work against your eyes! Trick your brain with lines and coils. Discover how mirrors and their reflections can play tricks on what you see. Try to touch a mirage. Make a Periscope to see above and beyond! Celebrate the science of color! Split your name in ink and reveal numbers with color filters. Color the world with your very own Technicolor Blender! Step into some healthy habits! Put together a food pie and lay out a perfectly proportioned meal. See how much energy burning calories can give you. Clip on your Step-O-Meter! Uncover the source of sound! Tap into sound wave transmission and fill your ears with vibrations. Create a story with sound effects and change the pitch of your voice. Use your Sonic Horn to make some noise! Exercise your sense of taste! Magnify your taste buds and unplug your nose. Try a carbonated test challenge. Sort out the scents in the scent challenge game! Take on temperature! Shake up a storm and see how friction creates heat. Witness an underwater volcano and experiment with thermometers. Learn what it takes to be a true globetrotter! Race a rocket and design your own car engine as you learn about thrust. See the principles of propulsion at work in a real rocket launch and build your very own Mad Science® Space Copter to fly to the skies! We’re on a mission to explore the atmosphere on Earth, and beyond! Travel to the end of the rainbow and make a sunset. Mix up various planetary atmospheres, one molecule at a time. Discover how NASA monitors planetary weather by using your very own Mad Science® Meteorological Station! This stellar program leads you through the life cycles of the stars! Learn about our star; the sun, and see stardust form. Use your Mad Science® Cosmic Disk and newfound knowledge about the constellations to navigate the night sky! Explore the farthest reaches of our solar system and create a lunar eclipse on our home planet. See the size difference between the Earth and its moon. Build your very own Mad Science® Gravity Assisted Launcher to simulate how gravitational pull affects a probe in space! Probe the mysteries of meteors and bounce around satellite light in this phenomenal program on space events. Take home a Mad Science® Space Telescope to explore faraway objects just like the satellites orbiting around the Earth! Experience the life of an astronaut as you suit up for space flight! Use teamwork to complete an important space mission and build a model space station. Bring home the challenge of repairing a ripped solar panel on the International Space Station with your very own Mad Science® Spacewalk Mission! Discover technology that’s out of this world! Steer a laser beam through a laser maze, and discover everyday objects originally designed for use in space! Take home a Mad Science® Stereoscopic Viewer and observe actual 3-D images from NASA’s probe transmissions! Discover the mystery in chemistry! Explore one of the most exciting and fundamental sciences as you watch water turn into juice and liquids turn into solids. Explore physical and chemical reactions with the Dynamic Dish kit. Take a tour on the electron freeway! Investigate conductors, insulators, and other elements in the world of circuit electricity. Get turned on to science and technology with the Circuit Maze kit. What do gravity, inertia, and centripetal force have in common? They are all part of the fun in this introduction to physics. Feel the pull of precession with the bike wheel gyroscope, and strike the perfect balance with the Gravity Game kit. Learn the science behind illusions, read minds, and perform a Houdini-style escape! Amaze and amuse friends and family with the Curious Cube kit. It’s not magic—it’s science! Fly through flight and aerodynamics basics! Discover the four forces that affect flight. Make and test various plane designs to see these forces in action! Build the Sky Hawk Foam Plane glider and fling it forward! Act like junior architects and engineers! Test out shapes for strength. See if which shapes are super strong! Construct a structure from scratch with the Bridge Basics kit. Join Bernoulli as we take an exciting look at the science behind air pressure. Create a whirlwind with an Airzooka vortex generator, and make pucks and balls levitate with air pressure! Launch foam rockets with the Air Blaster kit. Simulate the effects of an ocean oil spill, and develop creative techniques to clean it up! Create your own Wave Modulator while learning about water, waves, and the environment. Help crack a case. Inspect fingerprints, mystery powders, ink samples, and teeth impressions. Create a composite from memory. Use the Personal Profile kit to build an identity. Dig into Earth Science! Uncover rock samples and discover how they formed. Inspect fluorescing minerals. Model the moving plates that cause bends and breaks. See how sediment stacks with the multi purpose test tube. Cook up a chemical reaction! Blow up a balloon with yeast. Go on a nutrient hunt. Act out digestion from start to finish. Get a glimpse of your guts-in-action with the Digestor Inspector kit. See how simple machines lighten your load! Launch with levers, secure with screws, and work with wedges. Use pulleys to move heavy objects with ease. Wind-up the Drag Racer car for some zooming action. What makes toys work? Move out of the way for motorized toys. Take a spin with kinetic tops. Balance a bird to reveal its center of gravity. A twist of the wrist sets your Yo-yo toy spinning! 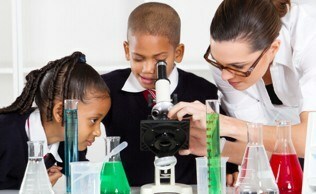 Use your hands as a real Mad Scientist in this whirlwind class on how a lab works! Learn to manipulate laboratory equipment at your personal lab bench, and take home your very own Graduated Gear to continue your research! Slide down the colorful pH scale and dip into the world of acids and bases! Explore the pH extremes with your Reaction Tube in what is sure-to-be a popping experience! Discover whether liquids found in your home are acids or bases using your personal pH Paper! Ooze into a gooey hour of sliming around! Create slime using the Mad Science recipe, and then enter the Slime Olympics! Take home your own concoction of Mad Science Slime! Hop on board the chemistry express for a high-speed science experience! Perform instantaneous experiments in this fast-paced class on split-second reactions that go like mad! Pick up an Action Flask and have a blast! Discover amazing things that glow bright in the dark and come to light! Probe the properties of light and explore some unusual applications of glow-in-the-dark technology! Use your Blacklight Writer to make secret messages that only you can see! Stick it to the walls, and push the power of tape to the limits in this adhesive hour on things that cling! Build a bond with glue and get attached to Professor Beakerdude! What is an animal? Children explore the animal kingdom and learn about the habitats, adaptations and life cycles of their favorite creatures. They experiment with animal calls and camouflage, and create their own Animal Tracks to take home. The ocean holds many mysteries. Children learn about its diverse life forms—from plankton to whales! They discover underwater habitats, and learn how humans can help protect ocean life. The Anaglyph Sea Puzzle lets children dive in and take the ocean home. Children explore the energy of motion. They pop, jump and flip with hopping, swimming and swinging toys. They check out the kinetic energy in rubber, band-wound gadgets and reach their potential with the Catapult Take-Home. Let's talk about telecommunications! Children chat over cables, link to a network and work with radio signals. Children wind through a cell tower relay and track cell phone users. They bring home the Wired World, an optical fiber telecommunications model. It's time to shake up solutions and explore mixture chemistry. Children sort out mixtures, clear color from a watery solution and see how useful a suspension can be. The Super Sorter gives children the tools to sort mixtures at home. Children catapult into Newton's three laws of motion! They yank a cloth from under dishes, send crash test dummies flying and launch mini-rockets across the room. They see action–reaction forces at work with the twirling Newton Spinner Take-Home. Children become wrapped up in the world of robotics! Volunteers act out a robot, remote control device and an automaton. Children control an automaton through sound and discover how robots sense the world! They build their own Robot Hand—a human-like end effector. How do we make electricity? Children explore renewable and non-renewable resources for power generation. They use mechanical force to turn on fans, and find out what makes a battery work. The Crank'n Shine gives children a chance to generate light! Recreate the process of rock formation and devise ways to identify and classify rocks and minerals. Experience the thrill of panning for gems; the gems you find, you can take home for further study and investigation. Be Tobacco Free is a one hour workshop designed to target children in grades K-6th to dispel many of the myths surrounding tobacco’s effects on the body. 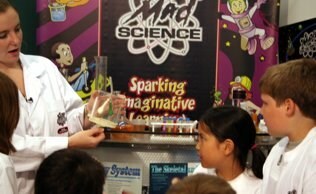 A pre and post package provides educators with additional resources to augment the program delivered by Mad Science. This has been used by many schools during “Red Ribbon Week”. This workshop was created for Earth Day programs in schools for grades K-6 as it features the science behind the 3 R’s – reduce, reuse and recycle. Students learn about the harmfulness of littering and how long it takes garbage to decompose. methodology used by scientists to formulate questions, make predictions, develop and perform experiments, collect and analyze data and draw conclusion. Students will be presented with a problem and asked to develop their own ideas to formulate a solution, make predictions, and test their solution. The goal is for all students to understand that when investigating scientifically, one should consider all the things that could change as variables, change only one variable and measure the response relative to the controls. Students will also discuss the implications of science in society, and investigate how their conclusions could impact the world around them.